Rich, durable, full-grain leather wine bag with leather strap, available in 2 colors. Dividers protect up to three bottles. No. Some padding w the wine dividers to protect damage but I wouldn’t expect it to keep wine cold. Not exactly, but it will keep the bottle's temperature for a couple of hours. Yes. I actually filled it with ice once and it was also watertight. 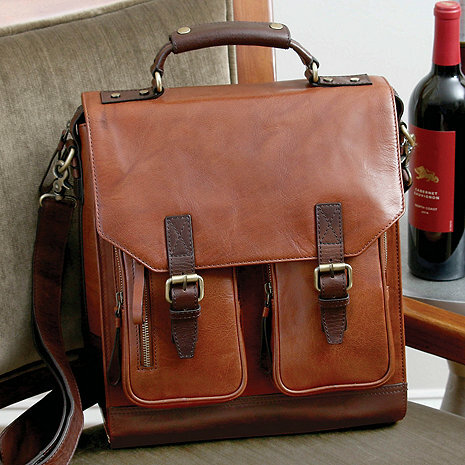 I need a combination wine and laptop bag. Does this bag have a pocket large enough for a laptop? It has bottle separators attached with Velcro which you can remove and a laptop will fit, but then the bottles will be loose. The inside Dim. is 12'Hx10'W App. could this hold 1 bottle and 2 large red wine glasses? BEST ANSWER: Yes, this wine bag will hold 1 wine bottle and 2 large red wine glasses. I happen to have a liter bottle of merlot and that fits also with 2 large red wine glasses--however, the fit is tighter (and taller) and I had to stagger the wine glasses a bit. It is a more comfortable fit with the traditional 750 ml size wine bottle along with the larger wine glasses. This past weekend, I used the leather wine carrier for two bottles of wine and cold packs in the center section to keep the bottles chilled. That worked nicely. Also, our guests complemented the handsomeness of the leather carrier. Hopes this helps. The 3 Bottle Leather BYO Wine Bag (Chestnut) can accommodate 1 bottle of wine and 2 wine glasses. The inserts are stitched into the bag on one side and have a velcro closure on the other, so the bag is versatile as well as being stylish and well made. Are the dividers for the bottles securely attached to the bag and not merely velcro attached? BEST ANSWER: The 3 Bottle Leather BYO Wine Bag (Chestnut) dividers are stitched to the rear of the bag and also have velcro on the front of the divider to adjust to the size of the bottle. The velcro part of the dividers really holds well and is very secure. It's nice to have the option to have dividers or not. The 3 bottle wine carrier's leather is beautiful with a very masculine over-all look. I haven't used it yet but purchased it specifically for summer events. I am looking forward to using it. This bag is everything I hoped it would be. Can not think of anything I could improve. Very sturdy with 3 bottles and looks to be moderately insulating without looking bulky. The inside height is enough to hold my tallest German Riesling (13 13/16”) if the bottle is tipped just a little to one side. Yes, I would recommend this bag to anyone who wanted to tote 3 bottles. Write your review here. It must be at least 50 characters long. Consider whether you would recommend this product and what you like or dislike about it. Excellent gift, well received by my customer.Thank youI own one also! Bought this as a birthday gift for son. It is beautiful, excellant leather quality. Perfect for someone special that loves wine, classy !! Love it! It looks great and works great. The 2 tone is very attractive and the shoulder strap is convenient for the weight of three bottles. The only thing I would change is the 2 straps. It would be easier if they snapped. At first, it seems extravagant. But if you carry around special bottles of wine and want to protect them in transit, this is a nice accessory. Handsome, strong, but also lightweight, it will hold four 750 ml bottles, as opposed to the advertised three. Why not arrive in style? Highly recommended.